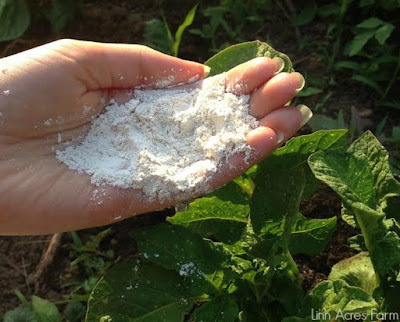 Linn Acres Farm: Using Diatomaceous Earth in the Garden + Giveaway! Using Diatomaceous Earth in the Garden + Giveaway! Have you heard of Diatomaceous Earth, or DE for short? It's become very popular in recent years because it is so useful! We buy it by the bagful. You can use DE in the garden for pest control, around the house to prevent ants, for cleaning, to treat fleas on your dog, to make homemade deodorant, as well as many other uses. 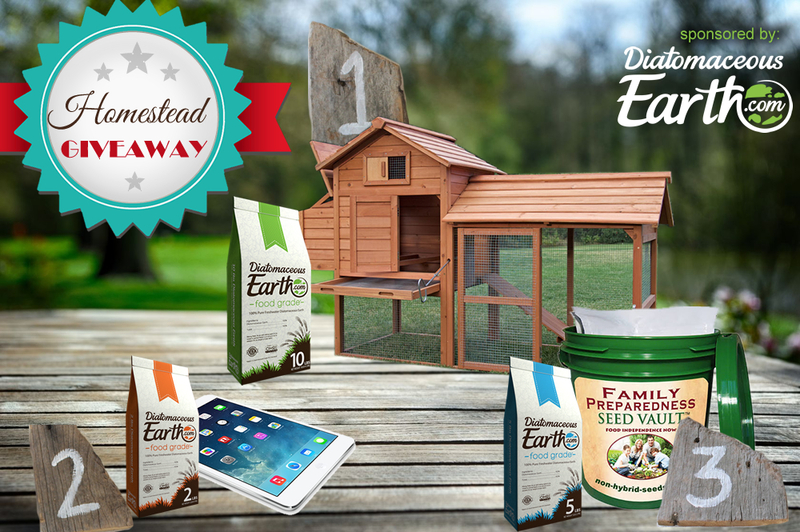 Be sure to check out the giveaway at the end of the post and enter to win some absolutely awesome items, such as bags of DE, an adorable chicken coop, a seed vault and even an ipad mini! You may be wondering, what exactly is it? DE is a very fine, soft white powder that is made of the tiny fossilized remains of aquatic organisms, known as diatoms. As these little creatures passed away, over time they slowly built up in the sediment on the floor of waterways, which formed sedimentary rocks. These rocks are soft and easily crumbled into the substance we know as DE. In 1836 DE was discovered in Germany and shortly thereafter it's ability to filter toxins out of water was discovered. Since that time DE has been found to be useful in many applications. 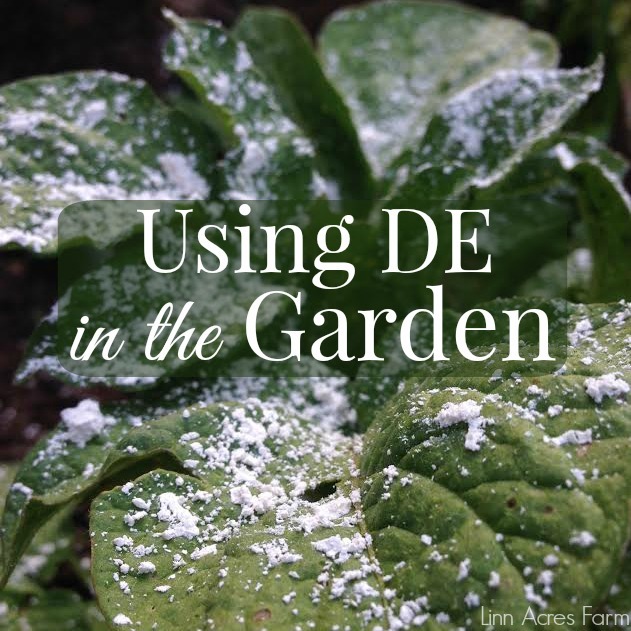 Our favorite way to use DE is in the garden. DE is non toxic (even food grade!) and is a completely natural substance. We are very hesitant to use anything for pest control in our garden and mostly rely on handpicking pests as needed. But occasionally it's just not realistic to handpick a certain pest or perhaps there are too many or maybe you're just squeamish about handpicking. DE can help! Although DE feels very soft and powdery to us, in reality the tiny microscopic particles are actually quite sharp. Although they are much too small to do any damage to us or any animals in the environment. But from a bugs point of view, DE is a dangerous substance. By sprinkling DE gently over the areas that the pests are frequenting, they will come in contact with it. Depending on the type of bug (soft and squishy or hard exoskeleton) it can work in different ways. In softer bugs, it can slice right through them and they are quickly gone from your garden. In bugs such as beetles, with a much harder exoskeleton, DE works it's way underneath their "shell" and will either cause them to dry out or simply irritate them to the point that they will leave the area. DE can even be applied to newly planted young fruit trees to prevent spring caterpillars from defoliating their tender young leaves. Our favorite way to do this is simply to apply it to the trunk of the young tree, which forms a barrier to the caterpillars from accessing the leaves up above. But remember to use DE sparingly, because while it is very effective on the bad bugs, it also affects the good bugs too! Apply early in the morning or late in the evening, which is when beneficial bugs are less active. Use in the garden only when needed and never apply it to blossoms. If you must apply to plants with blossoms or in areas that bees may come in contact with, you may want to use a row cover. As with anything applied to your garden, less is always more. When applying anything to the garden space where you grow your food, it's best to look into the safety of the item before using. So is DE safe? Yes! Food grade Diatomaceous Earth is safe even to ingest. It is non toxic to both us and other animals. It is safe around both children and pets. The one caution to be aware of is breathing in the DE powder can cause lung irritation. But in normal use, this shouldn't be a concern. It is perfectly safe to touch with your hands, or to use in the making of homemade personal care items such as face washes, deodorants, and tooth pastes. This giveaway was sponsored by DiatomaceousEarth.com and The Homestead Blogger's Network. What an amazing giveaway. Thank you for the opportunity!! Started using DE last year--really works! Love using DE!! Thanks for the giveaway! What an amazing opportunity! I keep hearing about DE! I subscribe to your posts. Saving the post on DE. Great info! This is the coolest giveaway ever! I heard about this giveaway via Google search. I just got a baby chick that this would be perfect for. She would be so happy to live in that mansion!! Many organic pest repellant recipes from guys at pest control Port Macquarie are designed to repel pests with a mixture of household items that are quick, easy and cheap to whip up.